SoftPlanet makes it possible for everyone to get free Virtual DJ Home FREE download directly from our servers. There is no registration needed for downloading. Virtual DJ Home FREE is a virtual DJ. Literally! This amazing software will turn you into a popular DJ in no time! It is a complete solution for mixing all kinds of music right on your desktop. The good news is that you can not only mix music and create new cool songs but you can also learn how to do this, which might be the first step for you towards a career in the music industry. Just open your MP3 file collection, select a few songs and start experimenting. Virtual DJ Home FREE also supports a number of effects so fire this program up, mix your beats and be the star of the party night! 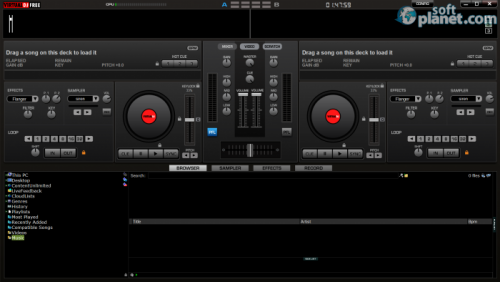 Virtual DJ Home FREE is some amazing software! It comes with an easy installation process that anyone could handle. But the fun part comes afterwards – you will be simply struck by the futuristic and feature-full interface of this interesting piece of software. You can add songs and edit them in numerous ways by adding effects, cutting and copying parts of the songs or making them play along with another song. This software is so powerful it will make you feel like a real DJ mixing the next smash summer hit like a real professional. This is not surprising - Virtual DJ Home FREE does feel very professional. 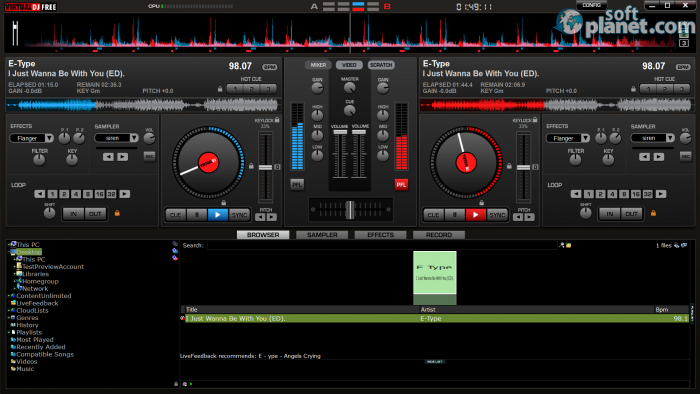 The interface of Virtual DJ Home FREE 7.4 will surprise and even confuse you a little when you run the program for the first time, especially if you haven't dealt with such software before. Essentially the program only runs in full screen mode as it features a large number of buttons, sliders and other tools and running it in a small window will almost make it useless. You will quickly see that there are two similar areas that divide the main program window in half. They offer pretty much the same functionality and these two are the places where you can add tracks to and mix them in numerous ways. You also get a large number of buttons and sliders to play with as well as a file browser at the bottom of the program window where you can search for music files to add to this program. 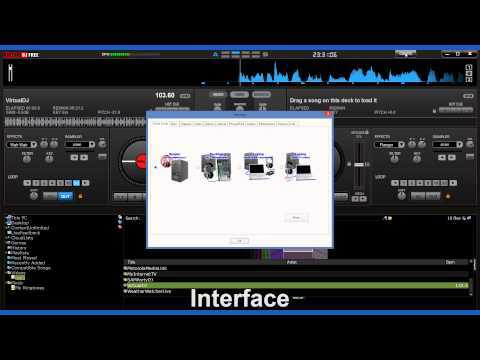 To work with Virtual DJ Home FREE you must have music tracks – it can't be any way around. So find at least one and add it to the program. Then you can play it and add various effects to it such as beats, scratches, slow downs, echoes and many more. If you have a second track you can add it to the other deck and play both of them at the same time. Once you've finished creating your new song then don't forget to record it or you will lose it. 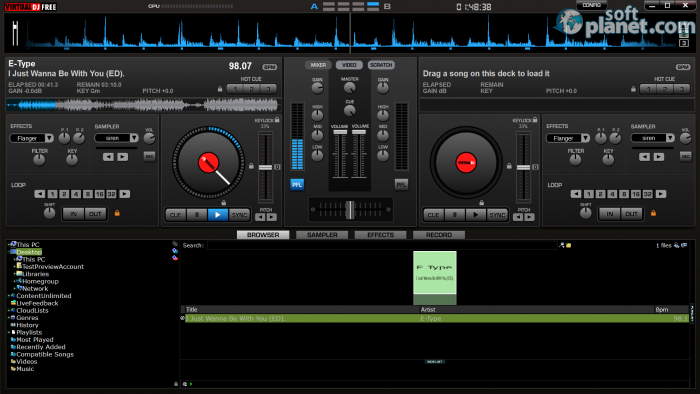 Our final evaluation of Virtual DJ Home FREE 7.4.1 is very positive. This program is very powerful, feature-rich and feels very professional. You can tweak your songs in numerous ways, add effects, mix songs and much, much more. The only problem with this software is that it is complicated so you will have to go through a difficult learning curve especially if you are not used to such software. But despite this we can't deny that Virtual DJ Home FREE is great software that gets the job done. Virtual DJ Home FREE is VIRUS-FREE! Our security scan shows that Virtual DJ Home FREE is clean from viruses. The current version of Virtual DJ Home FREE has been scanned by our system, which contains 46 different anti-virus algorithms. That ensures that Virtual DJ Home FREE 7.4.1 is 100% safe for your computer.